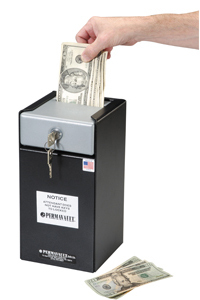 This safe is commonly used for the interim security of cash, checks and receipts. 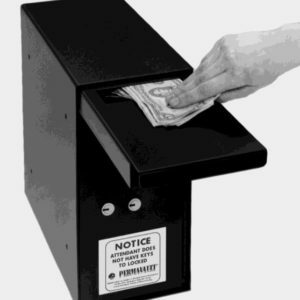 *Please note this safe is not recommended for deposits made from outside the building or where deposits are made from a location left unsupervised for long periods of time. Contact Us Today to learn more about our Custom GN Series Night Depositories. 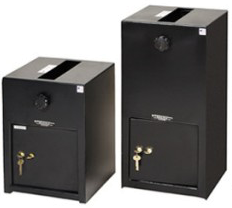 These safes offer higher security and can be custom-built to meet the particular size of almost any configuration. 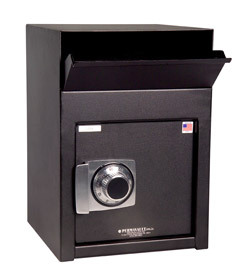 PRO-2217-K Compact through the wall depository (2-1/2″ x 10″ chute) with dual-custody safe deposit lock. Black finish. 17″h x 12″w x 12″d 75 lbs. PRO-2217-C Compact through the wall depository (2-1/2″ x 10″ chute) with group II combination lock. Black finish. 17″h x 12″w x 12″d 75 lbs. 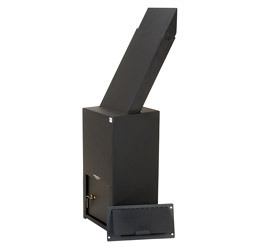 PRO-2217-E Compact through the wall depository (2-1/2″ x 10″ chute) with S&G 6120 electronic lock. Black finish. 17″h x 12″w x 12″d 75 lbs. operator keys and one (1) guard key. Black Textured Powder Coat Finish. 25″h x 12″w x 12″d 90 lbs. Textured Powder Coat Finish. 25″h x 12″w x 12″d 90 lbs. Perma-Vault PRO-2225 can be free standing or installed through a wall. Adjustable chute extends to 34” long (fits in a 10” wall, approximately). PRO-2225-COV Exterior security mail slot cover for PRO-2217/2225. Slot measures 2-1/2″ x 10″./td> 7″ x 14 8 lbs. PRO-2225-COVA Exterior security mail slot cover for Pro-2217/2225. Slot measures 3/8″ x 10″./td> 7″h x 14″ 8 lbs. PRO-2225-COVPLE Exterior security mail slot cover for PRO-2225. Black enamel finish. 7″ x 14″ (flap 5-3/8″ x 11-1/2″) 8 lbs.